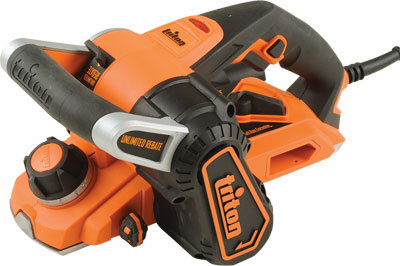 New Triton power tools are a bit of a rare event, and when they are launched you can bet they will be a bit different to the rest of the pack. This machine is similar in length to other hand planers but it is tall and heavy, with the motor sited above the cutterblock which is unusual, as is the forward loop handle. 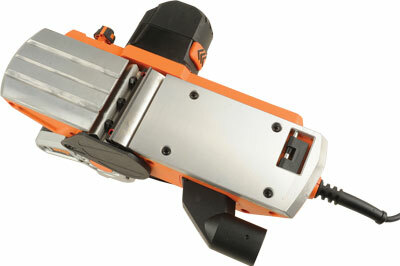 It shares the honour of being an 'unlimited depth' rebate planer with Festool's model. 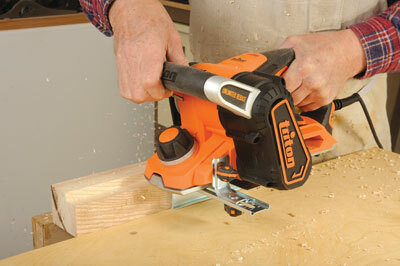 It also very unusually comes with a sanding drum that exchanges with the cutterblock. There are plenty of chunky controls, mostly rubber overmoulded for grip. Depth adjustment is via a finned rubber click-stopped knob at the front, on top is a lever for raising the cutterblock guard for rebating and blade changing. Mid-astern is a lever for switching the chipping outlet from one side to the other, and at the rear is a speed control, not normally required except for sanding operations. The switch trigger has a lock button intended for right-handed users although it is just doable if you are a leftie like me; there is also a power-on light on top. The TRPUL comes with a side fence, spare drive belt and a clip-in chippings spout. The soleplate is finely machined, with a 'park-able' sprung safety foot and three different size chamfering grooves in the front sole section. The aluminium cutterblock is withdrawn for blade changing and accepts reversible, disposable 82mm blades. A spindle lock and spanner are used for this. This machine is big and gawky with a high-set motor and handgrip. Most of the other features make sense, however. Planers create huge amounts of chippings but an extractor hose will hold you back; I set up a board for them to launch against and then sweep up later, though it is advisable to extract when drum sanding. The depth control was accurately set and the soleplates commendably level. The Triton coped well at all cut depths although at its maximum 3mm the planer did slow, but I wouldn't take that much off in a pass anyway. Rebating worked perfectly well, drum sanding much less so. At any speed setting on ash (Fraxinus excelsior), the motor slowed alarmingly, care was needed and the surface was not quite levelled, so not its best feature. For general planing work, a good machine for both fine as well as substantial stock removal.